Wednesday, March 13, 2019 – Blockchain Applications for Information Management. What is blockchain technology, and how does it work? How can blockchain solutions protect the integrity and prove the authenticity of your organization’s data? Lipyeow Lim will be joining us to present an interactive educational session on the use of blockchain technology in information management. Learn how emerging developments in data science can add value to your RIM program! Lipyeow Lim is an Associate Professor of Information & Computer Sciences at the University of Hawai`i at Manoa (UHM). 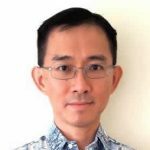 Dr. Lim’s expertise lies in information management, database technology, big data analytics and data science. He currently works with his students on various research projects such as analyzing Hawaiian language documents, forecasting solar irradiance in renewable energy applications, and identifying plants from natural images. He also serves as an IT consultant for several World Bank projects in China, Vietnam, Mongolia, and Malaysia. If you choose to PAY NOW, this option is for MEMBERS ONLY. The Paypal option is for NON-MEMBERS ONLY. If you DO NOT choose to pay now, please be sure to simply RSVP above for the event. Mahalo. If you choose to pay now, this option is for NON-MEMBERS ONLY. The TICKET SECTION is for MEMBERS ONLY. If you DO NOT choose to pay now, please be sure to simply RSVP above for the event. Mahalo.